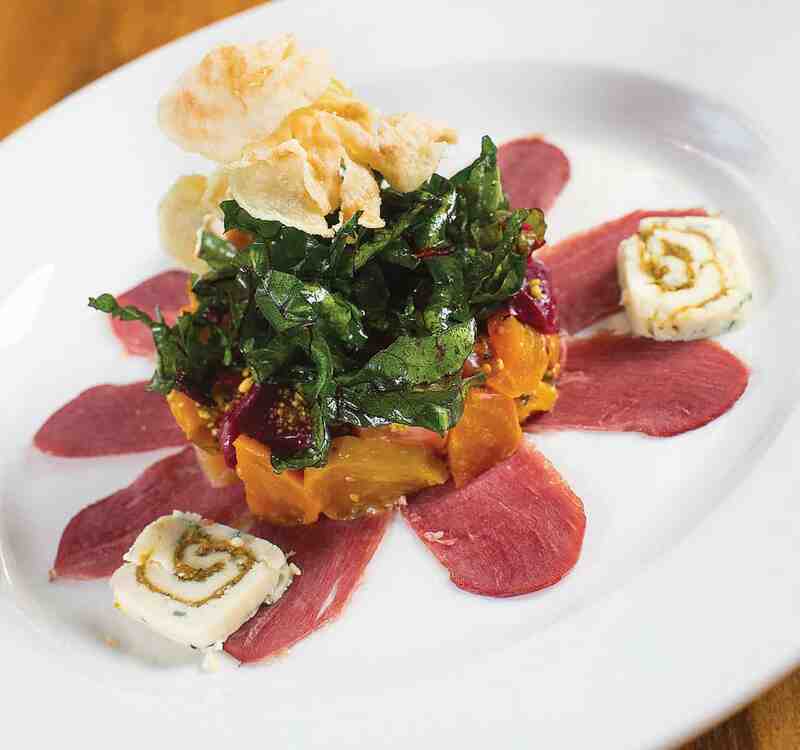 The menu at Wild Sage includes a roasted baby beet salad with smoked goose, Chioggia beets, crispy beet greens, Point Reyes blue cheese, and crushed pistachio rolls. Twenty years ago, when I was dating my now-husband, I was a young staffer at a glossy lifestyle magazine in New York City. I only remember the glamorous parts, including dinners at fabulous restaurants such as Raoul’s (steak frites) or Il Mulino (risotto porcini). Early on in our relationship, I saw a future with Alex, one filled with good food and drink. Never in a million glasses of champagne did I imagine that one day our good food would be wild elk, antelope, pheasant, and turkey that Alex had hunted. Even further fetched were the ideas that we’d store this good food in two freezers in our garage in Wyoming and we’d feed it to our four kids. “Wild turkey.” Hearing that still sends a slight shudder down my spine, though I can’t entirely remember why. Now “wild turkey” requires a three-day hunting trip and two days to braise and coax it out of its shoe-leather toughness. 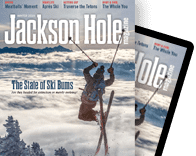 Fortunately, for diners in the valley, game meat preparation is a widely practiced, and perfected, art among Jackson Hole chefs. Game meat here has a range of interpretations that constantly evolves with the seasons. 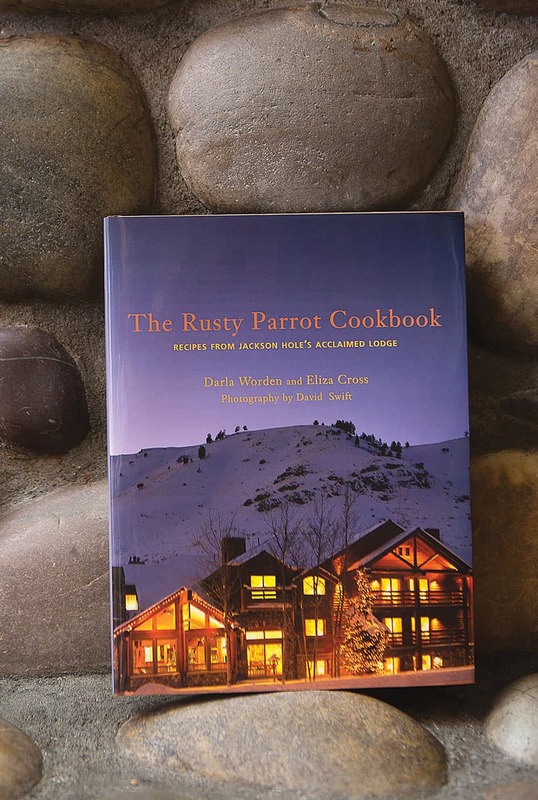 Complementing the herbal notes of antelope or tenderizing a chewy cut of elk into a velvety stew are commonplace skills in a valley chef’s wheelhouse. Game meat is to Jackson Hole what seafood is to Cape Cod. A highlight for many first-time visitors to the area is sampling game meat. Initial forays can be as approachable as a pizza topped with seasoned elk sausage or more adventurous, like bison tenderloin. Wild Sage’s game meat vendors are a hunter’s dream road trip: rabbit from Iowa, quail from Wisconsin, bison from Nebraska, and elk from Canada. The roasted rabbit loin is a favorite. The legs are confited and, saving the loins, the rest of the meat is ground into sausage. The loins are wrapped in the sausage, then roasted to medium-pink perfection. It is served over a black garlic pappardelle. Another favorite is the tea-smoked elk tenderloin, cold-smoked in-house with green tea. The elk loin is then pan-seared and served with a Thai-inspired orange demi-glace, a crispy scallion pancake on the side. 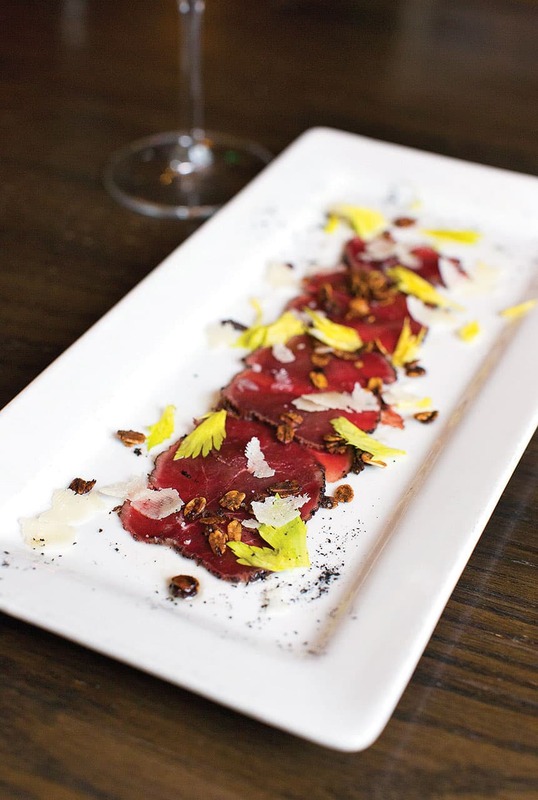 At Il Villaggio Osteria, the winter menu includes venison carpaccio with shaved Fiore Sardo, chopped celery leaf, and granola. 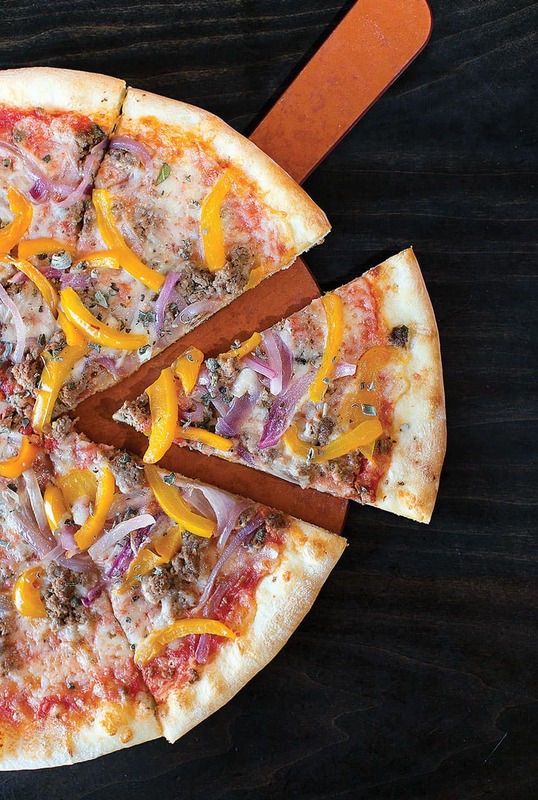 Pizzeria Caldera’s Il Bisonte pizza pairs bison sausage with tomato sauce, mozzarella, yellow peppers, fresh red onion, and sage. Originally published with a parsnip puree accompaniment, this recipe also pairs well with roasted root vegetables or a fresh baguette. Medallions of elk loin are marinated, dredged in a fragrant spice blend, seared, and served with a peppery lingonberry reduction. If grinding whole spices proves too ambitious, try quality ground spices in similar proportions. 1. The evening before cooking, marinate the elk. Portion the loins into approximately 8 servings. Mix the marinade ingredients and pour over the elk. 2. Cover and refrigerate overnight, turning once. 3. To prepare your spice crust, first grind the anise pods into a powder using a spice grinder. Then add coriander and peppercorns, grinding to a coarser texture. 4. To prepare the reduction, combine the ingredients in a medium saucepan and cook over medium-high heat until the mixture is reduced by 90 percent and small, syrupy bubbles form. 5. Preheat the oven to 400 F. Heat a large cast-iron skillet. 6. Remove the elk portions from the marinade (discard remaining marinade) and coat the elk on all sides with the spice blend. Sear the elk on high heat, 2 minutes per side. Finish the elk in the oven to desired temperature. Be careful not to overcook. Let it rest for 4 minutes. Slice the elk on the bias and serve drizzled with reduction.